A Dangerous Predator Is Loose! This fi-fo-fum presently besieges a small village high in the Alps of Switzerland. But it has designs on the world. It is a Rolexed, Gucci-ed homunculus anthropologists call Homo Davos — Davos Man. Each year he descends upon the Swiss resort. There he lives a gorgeous week in the company of his fellows. 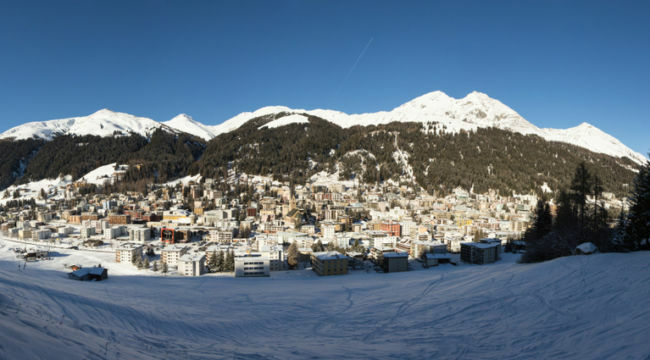 No coincidence, we hazard, that Davos is the penthouse of Europe, the highest city on the continent. What can be more symbolic? From his lofty perch he denounces the rest of us hellcats for our narrow and sinful ways. Populism, inequality, climate change, xenophobia, sexism, Donald Trump — these top his list of goblins. And from Davos he blackjacks national governments into embracing enlightened “global” perspectives. The nation-state cannot cure today’s headaches, Davos Man informs us. Global institutions must preside over the world’s nations… as the United States government presides over Kansas or Oregon or Texas or Maine. That is, this year’s solution is last year’s solution. As it will be next year’s solution. And the year following, world without end. Klaus Schwab is Davos Man himself — founder and executive chairman of the World Economic Forum that hosts the show. With more and more voters demanding to “take back control” from “global forces,” the challenge is to restore sovereignty in a world that requires cooperation. Rather than closing off economies through protectionism and nationalist politics, we must forge a new social compact between citizens and their leaders, so that everyone feels secure enough at home to remain open to the world at large. Failing that, the ongoing disintegration of our social fabric could ultimately lead to the collapse of democracy. The world must emulate Europe insists the European Commission, in grand self-regard. Whenever the peoples of Europe vote democratically to retain their national sovereignty, the European Union empties their votes into the wastebasket. Into its bag of parliamentary tricks it reaches… and employs every device of subterfuge to undermine them. 55% of French voters said the European Constitution can go hang. Days later, the demon Dutch rejected their own referendum on the European Constitution. Did the EU accept the results — results arrived at in the open democratic air and the light of day? They instead went around the voter… as a skillful burglar goes around security. The EU changed the wrapping and jammed the thing into what became the Treaty of Lisbon, ratified in 2009. And so the votes of millions were canceled at a stroke. Mr. George Orwell might have something to say here… were he still among us. And when precisely is Great Britain departing the European Union? In 2016 a majority of British voters opted out. In 2019… they wait yet. And if Europe bears the standard for democracy, please explain les gilets jaunes— the yellow jackets. So displeased were they with their government… tens of thousands of mostly middle-class Frenchmen recently ran riot in the streets. At issue was a burdensome gasoline tax that bore cruelly upon them. Elites justified the tax to battle climate change. But those it most affected were never consulted. The French government ultimately yielded — memories of the guillotine linger. But only after the rioters had half of Paris in siege. If this be democracy… then we ask to be excused. And the prescriptions Davos Man supplies never seem to apply to him. He would slow your carbon dioxide emissions to a trickle. Meantime, some 1,500 private jets will descend upon Davos this week. We must conclude this Davos Man is an exquisitely swinish fellow. A new framework for global public-private cooperation has been taking shape. Public-private cooperation is about harnessing the private sector and open markets to drive economic growth for the public good, with environmental sustainability and social inclusiveness always in mind.